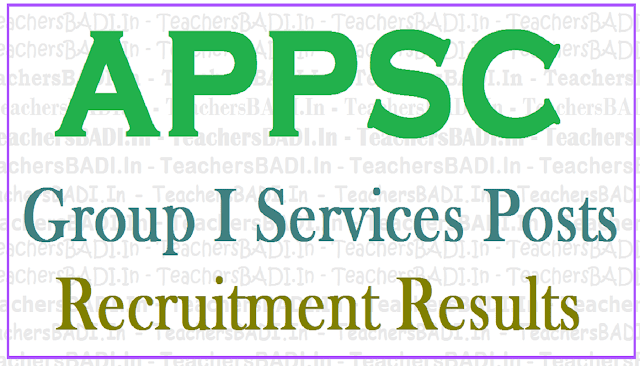 APPSC Group I posts 2011 Mains Results 2017, Oral test call letter, interview date: APPSC Group I posts recruitment 2011 Mains Results 2017, Main exam results, Group I posts recruitment Oral Test (interview) dates, Oral test call letter: On the basis of the Main (Written) Re-Examination held from 14/09/2016 to 24/09/2016 FN at Hyderabad, Vijayawada, Visakhapatnam, and Tirupathi for Group-I Services (Limited & General) Recruitment vide Notification Nos: 15/2011 dated. 30.06.2011 & 18/2011 Dt.28.11.2011, the candidates with the following Register Numbers have been provisionally admitted for the ORAL TEST (Interview) and Verification of Original Certificates in terms and conditions of Notification Nos.15/2011 & 18/2011 which will be held from 18.04.2017 to 10.05.2017, in the Commission’s Office, Prathibha Bhavan, Opp. Gagan Vihar, M.J. Road, Nampally, Hyderabad - 500 001 . The exact dates of Oral Test (interview) for each candidate will be placed in Commission’s website shortly. Individual call letters will be sent to candidates in due course. Candidates may download Check list, Attestation forms and Other relevant forms from the Commissions Website from 22-03-2017. A copy of this result can also be seen on the Commission’s Website: www.apspsc.gov.in and also in the Commission’s Notice Board. 2. The candidates who are qualified for interview (Oral Test) are required to produce the original Certificates at the time of verification of documents on the same day of interview, relating to Age, proof of age relaxation, Qualifications, Study certificate, Integrated Community certificate in case reserved candidates, certificate of exclusion from Creamy layer in case of B.Cs from Revenue authorities in terms of G.O. Ms. No.3, Backward Classes Welfare (C-2) Department, dt.04/04/2006, P.H. certificate in case of disabled candidates etc., failing which, they will not be treated as eligible with reference to the particulars furnished by him/her in the Online application form / Certificates. The results of such candidate(s) shall be cancelled at any stage in the process of selection. The Commission has the right to disqualify any candidate, if he/she is not found eligible for any reason. 3. In respect of posts of Deputy Superintendent of Police (Cat-2), Deputy Superintendent of Jails (Men), and Divisional Fire Officer (Men), (P.C.No’s.03, 04 & 05) the candidates have to undergo a Medical Examination before the competent Medical Board at Vishakhapatnam and also all the Disabled candidates have to undergo Medical Examination at respective Medical Boards. 4. Selections and appointments made under these Notifications are as per the judgment of the Hon’ble Supreme Court in Civil Appeals 9140/2013 and 9141/2013 orders dated.07.10.2013. read with in I.A No.1/2016 in CONMT.PET. (C) D 26349/2015 in C.A No.9140/2013. Dated. 29.06.2016. The list of candidates provisionally qualified for Oral Test (Interview) for Group-I Services Recruitment, Notification Nos:15/2011 & 18/2011 on the basis of written re- examination (conventional Type) held as per the judgment of the Hon’ble Supreme Court in Civil Appeals 9140/2013 and 9141/2013 orders dated.07.10.2013 read with in I.A No.1/2016 in CONMT.PET. (C) D 26349/2015 in C.A No.9140/2013. Dated. 29.06.2016 from 14.09.2016 to 24.09.2016 is available in the Web-site of the Commission psc.ap.gov.in and also displayed in the Commission’s notice board. The verification of Original certificates and interviews will be held from from 18.04.2017 to 10.05.2017. Interview dates will be intimated through Memo to all the individuals. Candidates may download Check-list, Attestation Forms and other relevant forms from the Commission’s Web-site from 12.01.2017. Result of re-examination (Main) of notification No.18/2011 &15/2011 General & Limited Declared. 2. The candidates who are qualified for interview (Oral Test) are required to produce the original Certificates at the time of verification of documents on the same day of interview, relating to Age, proof of age relaxation, Qualifications, Study certificate, Integrated Community certificate in case of reserved candidates, certificate of exclusion from Creamy layer in case of B.Cs from Revenue authorities in terms of G.O. Ms. No.3, Backward Classes Welfare (C-2) Department, dt.04/04/2006; P.H. certificate in case of disabled candidates etc., failing which, they will not be treated as eligible candidates with reference to the particulars furnished by him/her in the Online application form / Certificates. The results of such candidate(s) shall be cancelled at any stage in the process of selection. The Commission has the right to disqualify any candidate, if he/she is not found eligible for any reason. 3. In respect of posts of Deputy Superintendent of Police (Cat-2), Deputy Superintendent of Jails (Men), and Divisional Fire Officer (Men), (P.C.No’s.03, 04 & 05), the candidates have to undergo a Medical Examination before the competent Medical Board at Vishakhapatnam and also all the Disabled candidates have to undergo Medical Examination at respective Medical Boards at Visakhapatnam. Sub: APPSC–Direct Recruitment to Group-I Services – Oral Test (Interview) call letter – Intimation -– Regarding. Ref: Commission’s Notification Nos:15/2011 (Limited) dated. 30.06.2011 & 18/2011 (General) dated. 28.11.2011. * * * Sri/Smt./Kum. ............................................................... bearing Regd. No. ........................ a candidate for Group-I Services 15/2011 (Limited) & 18/2011 (General) Recruitment, is hereby informed that on the basis of the Written Examination (Mains) held from 14/09/2016 to 24/09/2016 he / she is qualified provisionally for admission for Oral Test (Interview) to be held on ....../...../2017 at the Office of the Andhra Pradesh Public Service Commission, Prathibha Bhavan, M.J. Road, Nampally, Hyderabad. He / She shall also undergo Medical Examination before the Medical Board constituted by K.G. Hospital, Vishakhapatnam on the date prescribed, by the Commission. As such the candidate should be prepared to go Vishakhapatnam even after the date of interview if he/she opts uniform posts or if he/she is claiming PH Reservation. He /She is directed to attend for verification of Certificates on: ....../...../2017 at 08.00 A.M in the Commission’s office, Hyderabad along with the following original certificates. Sl.No. Original Certificates along with one set of Photostat Copies of the same to be produced. II. Proof of age relaxation in case of A.P. State Government Servant (Regular service certificates from the concerned department, Government of Andhra Pradesh)/NCC instructor certificate/ Retrenched Censes service/Ex-servicemen certificate. III. Integrated Community Certificate (issued by the concerned M.R.O./R.D.O.). IV Physical Fitness Certificate issued by a Government Medical Officer not below the rank of a Civil Assistant Surgeon clearly indicating the Height, Chest and chest expansion etc. (for the posts for which physical measurements are prescribed). V. In case there is any spelling mistake(s) in the certificates produced by the applicant including the Degree certificate, the candidate has to produce a notarised affidavit. VI School Study Certificate from IV to X class if studied in School or Residence certificate in case of Private study in SSC for Seven Prior years including the study of SSC. VII Original Qualification Certificate i.e. any Bachelor Degree from any recognised Indian University. VIII Certificate excluding from Creamy Layer from Revenue authorities (for BC candidates only) as published in Para 13 of the Commission Notification No.18/2011 in terms of G.O.Ms. No. 3, Backward Classes Welfare (C-2) Department, dt. 4/4/2006. IMPORTANT: The above Original Certificates should invariably be produced at the time of verification of Original documents failing which he/she will not be admitted to the interview. No extension of time for production of any Original Certificates will be allowed for the reason whatsoever. The applicants will not be permitted to take the interview, if they do not satisfy the terms of the notification supported by required documents strictly. Therefore, the Candidates should ensure themselves in this regard in advance. The candidate should also fill up all the required particulars in both the copies of Attestation Forms and both the forms should be furnished at the time of verification of documents duly attested by a Gazetted Officer or a Member of Central or State Legislature. The candidate is also directed to affix his / her latest passport size photograph duly attested by a Gazetted Officer on the top of the each attestation form. Please bring 4 photos extra. Interview will be subject to fulfillment of all the conditions in the process of notification. If any BC candidate claiming reservation fails to submit Non-creamy layer certificate, it is open for the Commission to treat him / her as an OC candidate in the selection. The candidate must note that his/her admission to the Oral Test (Interview) is purely provisional subject to the condition that the eligibility and other aspects with reference to the Commission’s Notification No’s.15/2011 & 18/2011. If the conditions laid down in the Notification Nos.15/2011 & 18/2011 are not fulfilled by the candidate, his/her candidature for Interview to the posts falling under Group-I Services will be rejected. Request for submission of original certificates subsequent to the date of Interview will not be entertained under any circumstances. In the absence of any certificate, it is open for the Commission to decide the status at their discretion. Unless the candidature is formally confirmed by the Commission, it continues to be provisional.